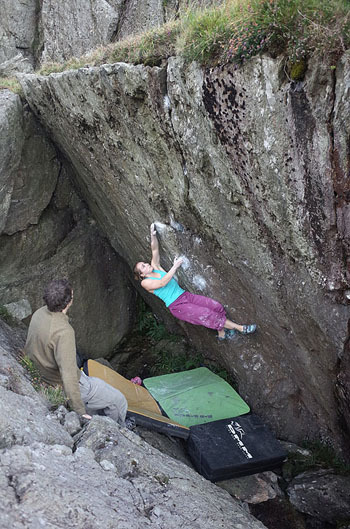 Last night Jemma Powell broke into the magic 8A grade with a repeat of Corridors of Power up at Bryn Hel in the Cwm Glas Bach part of the Llanberis Pass. On the first session last week Jemma was pleased to suss out a sequence that worked - a quick repeat seemed on the cards. A few days later an ascent of the notoriously difficult Rock Atrocity confirmed that she was climbing well - this top end 7C in Parisella’s Cave is undoubtedly 7C+ for someone of Jemma’s height (5’ 1”). Returning to Bryn Hel last night she was disheartened to find that the top crack was wet. Even after the liberal application of chalk it still seeped. Aside from the wet hold conditions were good so Jemma gave it a go anyway. She flowed up the lower moves only to be left with a slippy right hand for the committing move to snag the top of the wall. After a few more attempts the light began to fade and it became obvious that there was only time for one more go. Ace spotter, Tommy Chamings, did his best to dry and chalk the crack, while Si Panton donated his pads to help boost confidence on the final moves. Jemma chalked up and went for it, this time really milking a crucial drop knee to reach a drier part of the crack. Seconds later she was mantelling out the lip and skipping back down the descent. Corridors of Power was first climbed by Dave Noden in 2010 and repeated shortly after by Pete Robins. Dave though it “ballpark 8A” and Pete thought 7C+. In the last month it has seen a flurry of repeats with most people suggesting 8A or soft 8A. Corridors of Power 8A from Simon Panton on Vimeo.